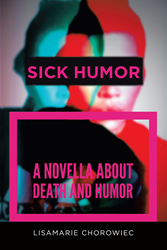 Recent release “Sick Humor” from Page Publishing author Lisamarie Chorowiec is a comical and satirical novel on the interpretations of death and dying. Faced with a cancer that will likely take her life, Lina decides to cram as much laughter, cynicism and wit into her process of dying as possible. Lisamarie Chorowiec, born in Queens and raised in New Jersey, has completed her new book “Sick Humor”: a hard-hitting and satirical take on the interpretations of death and dying. She is a loving mother to her daughter Patricia, and happily married to her husband Kyle. Lina is determined to undergo the whole process of her demise with as much laughter, cynicism, and wit as she lived in her everyday life. Understanding that death is simply another part of life, she invites readers to be ever aware of their mortality in this honest, sarcastic, and hilarious novel. Readers who wish to experience this thought-provoking work can purchase “Sick Humor” at bookstores everywhere, or online at the Apple iTunes store, Amazon, Google Play or Barnes and Noble.